Yesterday was the last day of the "Percy Jackson" class I taught this fall for the Huckleberry Center for Creative Learning. We had such a good time in this class that I thought I'd detail for you here a few of the things we did. This was a homeschool class of 12 eager devotees of Rick Riordan's series. 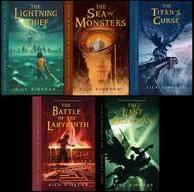 This is a series of 5 books in which Riordan melds Greek mythology with the modern world. He creates a world in which the main character, Percy, discovers that his real father is Poseidon -- making Percy a "half-blood" or demigod. The idea underlying the series is that Mount Olympus moves with the heart of Western Civilization/democracy and so because the United States is currently the "seat" of democracy in the world, Mt. Olympus is accessed through the Empire State Building (special elevator key required), the entrance to Hades is in Los Angeles (of course) and the labyrinth of King Minos/Daedelus continues to expand and move just underneath the earth's surface. The series provides a captivating and entertaining way for kids to understand the complex system that is ancient Greek mythology. Because it's set up as "Camp Half-Blood," which like J.K. Rowling's "Hogwarts" provides a space just for kids to learn, it allowed me to create a “classroom” version of the camp. And like Harry Potter, students were able to choose a mythological parent from the "big 12" Olympians instead of a Hogwarts' "house." (If you'd like more info on how I taught Harry Potter, see my earlier posts on "How to Teach Harry Potter," and Teaching and Project ideas for the "Deathly Hallows." or "A Typical Teaching Day," which includes info on both HP & PJ). The Percy Jackson & The Olympians series advocates a strong value system based on courage and a clear sense of choosing between right/wrong. Each demigod has a fatal flaw (as we all do J) -- Annabeth Chase's is pride - she's the main female character (very smart.... daughter of Athena); Percy Jackson's flaw is immoderate loyalty/protectiveness towards his friends without always looking at the bigger picture/goal -- he's not an "ends justify the means" kind of guy. The various demigod kids grapple with a bit of pre-teen/teen angst (Percy is 12 in Book 1 and 16 in Book 5)--feeling abandoned at times by their immortal parents who rarely interact with them. It also has cute modern touches like, "you may be a demigod if you suffer from ADHD or dyslexia" -- the dyslexia comes from being more at home reading ancient Greek and the ADHD is just a reflection of your quick reflexes (necessary for fighting mythological monsters). 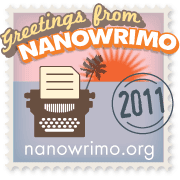 The story actually began as the author's attempt to help his son reconcile himself to these issues. In class, each of the 12 students chose a Greek god or goddess to be their mythological parent and we set up cabins reflecting the various attributes of the gods they chose. We had 14 weeks for the semester, so I set up a schedule whereby, after the 1st class -- where we chose cabins -- we'd spend 2 weeks on each book and reserve 3 days for outdoor "Camp Half-Blood" activities -- Archery, foot races, Capture the Flag, etc. (all integral activities from the books). Then I chose some of the less well-known myths/characters from each book in the series and created a series of "Quests." In most of the books, the half-bloods go on a Quest involving 1 leader and "usually" 2 assistants. So, each of my Quests involved the same (one student acting as leader + two assisting students). Each Quest focused on 2 mythological characters. The Quest "leader" would assign one of the mythological characters to each of his or her assistants and they would create a presentation for the class detailing all the information they were able to find on that character. These "assistants" created beautiful story boards and gave quite impressive presentations (practicing a bit of public speaking in the process). The leader then would write (& read aloud for the class) a short story (minimum 500 words) in which all 3 quest participants encountered the mythological creatures and battled them -- so now at the end of the semester we have a beautiful book of short stories (our own little version of PJ). Each week in class we'd hear the Quest reports and then we'd look at a "god or goddess of the day" (whoever I'd chosen that week to go along with the book we were focusing on) and then usually we'd do a craft. We made pipes for Pan, non-alcoholic wine for Dionysus, snake hair for Medusa, recycled metal creatures for Hephaestus, bows and arrows for Artemis, Laurel Wreaths for Apollo, labyrinths for Daedelus, ambrosia, nectar and many, many more. Yesterday we finished our "Camp Half-Blood Necklaces" -- done as in the series, with a bead (we made our own from clay) designed and inked to represent each book. We had a such a great time in this class and I'm really sorry to see it end. It will definitely be one I teach again. The Percy Jackson series provided a captivating story-line for the kids and had them very excited about a complex subject. Knowing mythology helps immensely with literature and I wish I'd had a series like this to help me retain these concepts. The class not only extended their understanding of mythology, but gave the kids another chance to enjoy books as a group. This class became a huge celebration of the "worlds," literature can provide and I loved that about it.